Good cinematic ghost stories are as rare as hen's teeth, at least ones that actually chill your bones and make you believe, just for a short while, that such entities actually exist and that sharing space with them might not be such a good thing. Ask a long-standing genre fan to pick out a few favourites and Robert Wise's 1963 The Haunting will invariable on or quite likely at the top of the list. 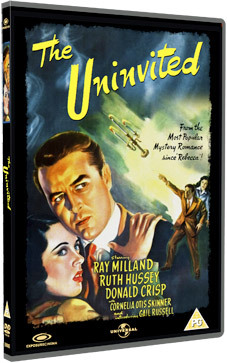 But preceding it by almost 20 years was a similarly chilling but too little seen tale of restless spirits titled The Uninvited, starring Ray Milland (Dial M for Murder, The Lost Weekend) and Ruth Hussey (The Philadelphia Story) and directed by Lewis Allen (Desert Fury, Chicago Deadline), here making his feature debut. Seeking respite from the bustle of London life, writer Roderick Fitzgerald (Ray Milland) and his sister Pamela (Ruth Hussey) move into a neglected clifftop mansion and set about making it their home. However, it isn't long before an unnerving presence makes itself felt: an eerie chill lingers in the rooms and distant wailing is heard at night. Despite Roderick's cynicism, it becomes increasingly clear that the house is haunted – but why in such a snug haven would the dead trouble the living? Based on the novel Uneasy Freehold by Dorothy Macardle,	The Uninvited was one of the first Hollywood features to portray a haunting as a genuinely supernatural event, the film was number 11 on Martin Scorsese's list of the scariest horror movies of all time. The Uninvited will make its world DVD debut (it was previously only available on VHS and LaserDisc) as a Collector's Edition on 7th May 2012 from Exposure Cinema at a yet to be confirmed RRP. Illustrated collector's booklet featuring exclusively commissioned articles and four lobby card reproductions. UPDATE: The release has now been postponed until 29th October 2012.